The wolf pack seems like the perfect example of how unity can provide strength, of how fierce and often vicious hunters can work together for the common good. Unfortunately, that's a big lie. Turns out many wolves are freeloading bums. At least, that's what researchers from the University of Minnesota discovered when they examined the elk hunting patterns of various wolf packs in Yellowstone National Park. 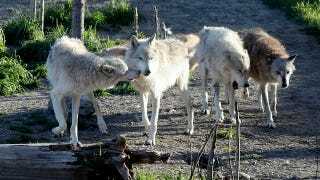 They discovered that the success of the hunting pack leveled off after as few as four wolves — there was no extra benefit to adding a fifth or sixth wolf. Any wolves beyond the four main hunters tended to hang back and contribute very little to the hunt, until the prey was fatally wounded — at which point they swarmed in and took their unfair share of the prize. No matter how you spin it, those are some seriously uncool wolves. Beyond four wolves, hunting success leveled off, and individual performance (a measure of effort) decreased for reasons unrelated to interference from inept hunters, individual age, or size. But performance did drop faster among wolves with an incentive to hold back, i.e., nonbreeders with no dependent offspring, those performing dangerous predatory tasks, i.e., grabbing and restraining prey, and those in groups of proficient hunters. These results suggest that decreasing performance was free riding and that was why success leveled off in groups with more than four wolves that had superficially appeared to be cooperating. That's the worst part - these packs "superficially appeared to be cooperating." If these lazy wolves are fooling human researchers, it's very possible that they're also fooling their fellow wolves so that they don't even know they're getting ripped off. We might be looking at something a lot worse than wolf freeloaders - we may have full-blown wolf grifters on our hands. I'm simultaneously outraged by their behavior, and amazed at how cool the idea of a "wolf grifter" sounds. Via the Journal of Behavioral Ecology. Image by jurvetson on Flickr.